He is the most read LinkedIn author on the topic of sales leadership and speaks at conferences internationally, including at Salesforce World Tour events. He also teaches modernized selling within the MBA Program at The University of Technology in Sydney and sits on a number of advisory boards. Tony is a powerhouse of knowledge, and I am going to share a variety of amazing tactical sales processes and tips of his in this article. You can expect to gain insight on the world of selling, tools you should be using, and how to be successful in sales. The biggest problem most organizations say they have is they don’t have enough sales pipeline. Most salespeople and sales managers will say they know how to sell but don’t have a large enough pipeline. The truth is, not enough pipe is a symptom of deeper issues. People haven’t thought hard enough about the intrinsic value they offer the markets they pursue. They haven’t thought deeply about what an ideal customer profile looks like. People are failing to build pipeline because they don’t know how to have the appropriate conversation and narrative. They also don’t have the right level of activities. The rise of the silent sales floor is killing companies. 80 percent of what a salesperson does related to building pipeline can be automated. The most powerful way of engaging someone is through trigger events, and the fastest path to revenue is referrals. If you have those four things, you can kill it but you need to know how to use each of these effectively. If someone has a negative experience with your competitor, people will post on social media about it. This gives you a cause for outreach. You can use this to establish a connection but you shouldn’t badmouth the competitor. Most people don’t consider the objections people will have. If you get an objection, it’s typically because you sought progression before the other person was ready. You should always be trying seeking progression before closing a deal, unless the next potential progression is to close. There should be a level of confidence. You should work with the person. The seller should be seeking alignment and finding customers that are aligned with their ideal client profile. The reality is that as human beings, we have always been wired to treat the telephone, in the context of sales, like it’s covered in spiders. No one likes rejection. We misinterpret people not responding to us as people rejecting us. On average it takes seven to 13 touches to get someone to engage with you. One, two or three attempts is you usually not enough. Be persistent. To break through, you have to use all of this in combination. Make the phone the heart and center of your outreach. If you fail to make the sales process human, you can expect to fail. The number one mistake sales managers make is trying to manage by results. The thing that is vitality important is people are not going to get back on the phone assertively if they don't have the right narrative. Selling is about the transference of belief where the seller absolutely believes they are making a difference in the lives of their customers, both personally and professionally within their business. Then they need a narrative that talks about how their customers can move the needle on key metrics that really matter to that customer. You have to make sure they are full of belief, have the right narrative and then you need to manage the activities that feed into sales objectives. If you want to create a culture, then culture is something that is led by example. Culture is nothing more, nothing less than the behavior of the leaders. Do the things you are asking others to do and live your culture by example. Senior people start early and tend to get out of meetings at 4 or 4:30 p.m. What sellers need to do is to time block outbound calling and outreach. You don’t know which channel works best for your buyer. Try all of them until you find the one that does. A minimum of 30 combos a day is what it takes to build pipe in the world of B2B selling. You need 2 one-hour blocks to execute 30 to 50 a day. Don't go home until you have your morning planned for the following day. As the owner of the business, so much of the value you see in the business is from all of the blood, sweat, tears and money that you poured into creating your tech-based solution or app. The reality is, you have to get out and become crystal clear and laser focused on your messaging and which problems you solve for which people in which industries. It's about what problem do I solve and how does solving that problem monetize for my customer. Call prospects and stress that you work with similar customers in their industry and commons things seen are. Proceed to tell them how you can add value and ask if it makes sense to have a conversation. What happened in your organized that started you down the path that eventually led to us? How is your business positively materially different than it was two years ago? If you are selling something, being able to tell the stories of your current customers can be extremely beneficial. After getting your messaging right, creating your ideal customer, sized your market and got the right narrative, you need to onboard salespeople and equip them with the correct tools. A great book to check out is Cracking the Sales Management Code - Jason Jordan. It’s a great book written on sales management, recommended by Tony Hughes. Each day you should focus on creating pipeline and opportunity progression. You need to be a true believer. You need to have great values. Buyers are not stupid. If you are not all in on what you are doing, people will notice that. You need complete integrity as a person. Selling can get a bad wrap but it’s incredibly important. Selling feeds everyone else. You also need a really strong work ethic. There are lots of things you have to do to be successful in life; just do it and get on with it. In this article, I talked about how technology is changing the world of selling and the role artificial intelligence plays in that. I also listed the sales tools Tony Hughes believes your really need to be successful in the world of sales today. You also learned about what buyers want and why objections are for amateurs. Silent sales floors are a huge issue in the sales world today. I shared action items to shift away from a silent sales floor to see increased success. This article also covered time blocking; what it is, how to do it and why it’s beneficial. In addition, you learned about getting your messaging right, creating your ideal customer, sizing your market and getting the right narrative to effectively prospect and sell. 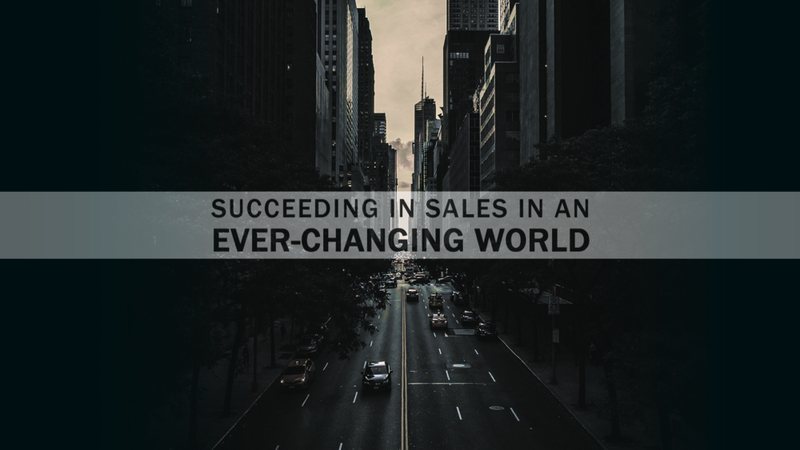 Overall, you should now know how to succeed in sales in an ever-changing world.